After losing their vocalist, bassist and drummer in 2010 shortly after much-praised sophomore release The Shadow Over Atlantis, many would have forgiven The Wounded Kings for giving up altogether. But such is not the path of doom, and a year and a bit later the British band are back, with four new members and a new album. Here’s the first surprise: new vocalist Sharie Neyland is female. Here’s the second: it really makes no difference. Where previous vocalist George Birch had the sort of eerie, distant voice that hung over the gloomy proceeding like a particularly mournful ghost, Neyland is slightly more strident, but the effect is much the same. Her witchy tone gives the solid doom riffing and faint keyboard backing a creepy occult tone that the band revel in, giving their lengthy tracks a hypnotic grandeur that keeps your ears affixed. They’re as capable of using simple, catchy melody in epic ways as they are the big doom riffs, making for a varied sound all in all, yet one firmly traditional, and firmly doom. In The Chapel Of The Black Hand is a pretty straightforward album, with three long tracks and one short one. Each track is a new epic, the riffs that open Gates Of Oblivion tolling like funeral bells and Neyland moaning a bleak eulogy over some gorgeously miserable guitars. 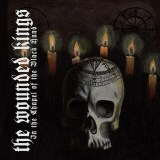 The Wounded Kings have the same heritage as My Dying Bride and other British Doom bands, placing their brand of gloom closer to the funeral doom genre – although there’s still that very obvious musical link to Candlemass and the true doom set. It’s increasingly rare nowadays to find funeral doom bands with clean vocals that don’t completely descend into the sewers and croak black metal-fuelled hatred at you. Here, as instrumental Return Of The Sorcerer proves, The Wounded Kings have some classic rock blood in their veins, and it’s that which helps in this atmospheric of ancient gloom that they wrap themselves in so bewitchingly. From start to finish, just over forty minutes later, In The Chapel Of The Black Hand is a dark delight that will please traditional doom fans enormously.